Up in North Devon three ORCs took part in the Exmoor Coastal Trail Series on Saturday. Debbie Bryant and her daughter Daniella ran the 10k while Mervyn Rice took on the challenging half marathon. Luckily the weather was on their side and the stunning scenery made coping with the difficult terrain worth the effort. On Sunday we were well represented at the Tavy13 Half Marathon with eighteen ORCs taking part. Hills and gale force winds were the order of the day although thankfully the heavy rain held off! Some very good results were still recorded – Andrew Vallance put in a strong run to come third, Roger Voaden also ran an impressive race to come fifth and also claim the 1st MV50 prize. Not far behind was Paul Carter who came twelfth and took 2nd MV50 and together with Andrew Vernon the four took the 1st Male Team prize. Mark Hawkins, running his first half marathon after only taking up running three months ago, ran very well and was pleased to finish in sub 1.55. The ladies put in a great performance too, with Karen Vallance, Jayne Peachey and Abby Metherall running and finishing the race together to be the 2nd Female Team. 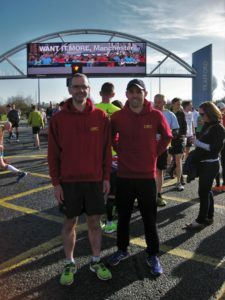 In total contrast the fast flat Manchester Marathon course was the venue for two other ORCs on Sunday. Stuart May and Matt Pitson both had excellent runs there with Matt smashing his previous PB and Stuart, having only just shaken off a cold in time to run at all, securing a new PB as well. Error: Error validating access token: Session has expired on Saturday, 20-Apr-19 03:20:42 PDT. The current time is Monday, 22-Apr-19 11:48:38 PDT.